2018 Afriquia Merzouga Rally kicked off on the 15th of April 2018. The day consisted of a free-practice session and a prologue stage. This is the 9th edition of the gruelling rally event. TVS factory rally team and Hero MotoSports Team rally also began their rally outing with the event. The Rally offers an ideal training ground for the teams to kick start the preparations for the mighty Dakar. At the end of the prologue stage, Sherco TVS Factory Rally team’s Joan Pedrero stood at the 4th position followed by Lorenzo Santolino at 5th. Hero MotoSports Team rally’s Oriol Mena finished at 13th while C S Santosh finished at 27th position. Sherco TVS Factory Rally Team’s debutants Duplessis Diego Martin and Vanni Cominotto finished at 15th and 34th respectively. The Merzouga Rally is a grueling 5-day rally raid that takes place annually in Morocco, among the dunes of Merzouga. Participants at the event will have to deal with rising ambient temperatures of the Moroccan desert, stimulating sand sections and tricky navigational challenges. The demanding rally provides excellent preparation to riders who wish to compete in the Dakar Rally scheduled for later in the year. The first full day of the rally (16th April) will offer the riders with a 207 km special stage as a warm up to the competition and putting their navigation skills to the test with relatively complicated navigation. Stage 1 of the Merzouga Rally comprised of just over 200 kms of two relatively simple loops, with their respective starts and finishes at the same place. The first portion of the stage tested the riders with relatively complicated navigation leading onto the second loop that offered dunes, sand and water zones. 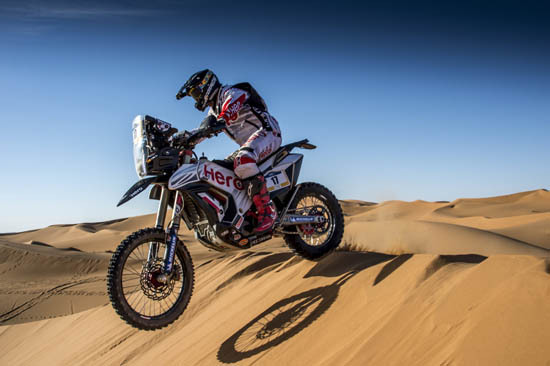 Oriol Mena of the Hero MotoSports Team Rally rode solid from the beginning, tackling the tricky navigation to finish at 11th position, in the stage as well as overall rankings. His teammate CS Santosh secured the 20th position in both stage and overall rankings. Stage 2 of the rally was marked by special stage of 175 kilometres for the riders to race in the Erg Chebbi region of Merzouga. Split into two loops, the stage challenged the riders with dunes at the beginning and end of each loop with faster tracks sandwiched in between, making it a more physical stage, made even harder by the complicated navigation. Oriol Mena started strong in the initial part of the stage and but lost some time due to an electrical snag. C S Santosh, who was coming from behind, stopped over to help his team mate with a quick intervention that ensured that both the bikes reached the finish line safely. Oriol finished the stage 2 in 25th position while C S Santosh in 28th position. Sherco TVS Factory Rally team’s Joan Pedrero stood at 8th at the end of the stage followed by Duplessis Diego Martin who climbed up to 9th. Lorenzo Santolino secured the 10th position while Vanni Cominotto finished the stage at 24th. Commenting on his performance, Joan Pedrero, Racer, Sherco TVS Factory Rally Team says, "I felt very good in the dunes and finished the stage without any major problems with the bike. Looking forward to the marathon stage tomorrow as it will test both man and machine." David Casteu, Team Manager, Sherco TVS Factory Rally team said, "It was a big stage with a lot of navigation but I am thrilled we passed the test. Seeing our riders arriving in the lead group despite the strong competition from the other teams was a true pleasure." Martin Duplessis said, "It was a very good stage and I am very happy with the bike and my performance in this stage. The team is doing great and I am happy to contribute to the success of the team." Lorenzo Santolino said, "I started the day very well but I lost too much time after a small fall near the finish line. Tomorrow is an important day but we are ready." Red Bull KTM Factory Racing’s Toby Price posted the third fastest time on stage two of the 2018 Merzouga Rally. KTM Factory Racing’s Laia Sanz completed the day in 16th position. Setting off early in the morning at 7.00am, riders initially struggled with visibility due to the rising sun. Toby Price kept his head down and concentrated on both his navigation and maintaining a consistent pace on the timed special. At the finish, Price posted the third fastest time for the day, just over three-minutes down on the leader Kevin Benavides. The stage 3 will mark the beginning of the 2 day marathon stage that will be the highlight of the rally. A total run of 304 km including the special section of 241 km will form the first part of the Marathon stage of tomorrow, where the riders will camp in the dunes overnight without any support from their assistance crew. Last edited by NewsReaper; 04-18-2018 at 01:15 PM. Stage 3 of the rally marked the first of the two days of the Marathon stages. Being the highlight of the rally, the performance in these stages typically separates the leaders from the rest. Competitors will have to go through the night without the aid of their assistance crew and get ready for the part two of the Marathon stage. The Marathon stage was made of a long liaison of 63 kms followed by the 240 km stage where the riders had to negotiate the dunes of the Rissani erg, those of the Chebbi erg, sand in the Fezou region, and the Ouzina erg before arriving at the campsite in the middle of the dunes for an evening in the heart of the desert. It is imperative on the stage for competitors to conserve tyres and machinery where even a minor problem could mean the end to their rally. Oriol Mena, shrugging off a minor set-back of stage 2, made good time today to climb up several places to finish the stage 3 in 14th position. CS Santosh also kept a steady momentum to finish the stage 3 in 27th position. Overall, Oriol stands at 16th place and C S Santosh at 20th place at the end of Stage III. At the end of stage III, Sherco TVS Factory Rally team’s Joan Pedrero stood in the overall rankings at 8th followed by Lorenzo Santolino at 9th. Duplessis Diego Martin maintained his good run with a finish at 11th while Vanni Cominotto finished the stage at 24th in the overall rankings. Red Bull KTM Factory Racing’s Toby Price has posted the fourth fastest time on stage three of the rally. Laia Sanz was at 17th at the end of the day. Following his third place on Tuesday’s stage two, Toby Price set off just after 8am with just two riders ahead to chase down. He decided to concentrate on his own navigation and riding to a fast but steady pace to minimise mistakes. He put in a strong performance to finish as the fourth fastest rider at the end of the 241km special. He is currently at 6th in the provisional overall standings. Stage 4, the second marathon stage, will see the riders negotiate another 233 km of special stage sandwiched between 36 km and 103 km of liaison sections, finally reuniting with their assistance crew at the Tombouctou hotel with only the last stage remaining to decide the rally champion., will see the riders race through dunes before reaching the Errachidia plateau. Featuring a 233-kilometer special in a total of 372 kilometers, the stage will once again see the racers get no help from the service crew. Stage 4 of the Merzouga Rally marked the second half of the event’s two-part marathon stage. After completing the tough 241km stage 3, riders stayed overnight in the temporary bivouac before heading out onto today’s stage 4, having received no technical assistance from their teams. Competitors not only had to face the usual changes in terrain and difficult navigation associated with the rally, but also had to conserve their machinery in order to endure the 475km of timed special raced over the course of the two days. The second part of the Marathon stage was made of a 233 km long stage sandwiched between two liaison sections of 63 kms and 103 kms respectively. The riders first encountered the initial dunes sector that then led them to faster tracks just until they reached the Errachidia plateau where a labyrinth of tracks complicated the navigation. Toby Price and Laia Sanz have both finished within the top-five on the penultimate stage of the 2018 Merzouga Rally. Red Bull KTM Factory Racing’s Price completed the 233km timed special in fourth with a time that elevated him to second in the provisional overall standings. KTM Factory Racing’s Laia Sanz placed just behind her team-mate posting the fifth fastest time. Toby Price set off from the bivouac at 6.30am this morning on the short liaison section that led to the start of the stage four special. Price put in a superb performance catching and ultimately passing the three riders ahead of him to be the first to arrive at the finish. His fourth place on today’s stage moves him up to second overall with just the short 50km, mass-start final stage to go. KTM Factory Racing’s Laia Sanz rode a fantastic marathon stage. She posted the fifth fastest time on today’s stage four – a testament to her hard work and experience. With just one more stage to contest, Laia lays 13th overall and is keen to improve her final ranking with a good result tomorrow. It was a tough day at the Merzouga Rally as many riders lost their way towards the end of the stage in an attempt to find a really tricky waypoint. Oriol started the stage well but just after a few kms, he had a hard impact to the bottom of the bike while come fast down a dune. After that he decided to take the rest of the stage in a slow and cautious manner. Towards the end of the stage he lost some more time in trying to find that last waypoint, along with many other riders who got lost in the same area. His team mate, C S Santosh, was having a good stage, riding well through the dunes and the faster sections until he also got lost around the last waypoint and lost a lot of time before he could find the right way. More importantly, both the bikes and riders arrived at the bivouac safely to reunite with the team, keeping the team’s campaign alive at the Merzouga Rally.\Oriol finished the stage 4 in 40th place, taking him to the overall standing of 17th, while Santosh finished the stage in 37th position, retaining his overnight ranking of 20th in the overall standings. 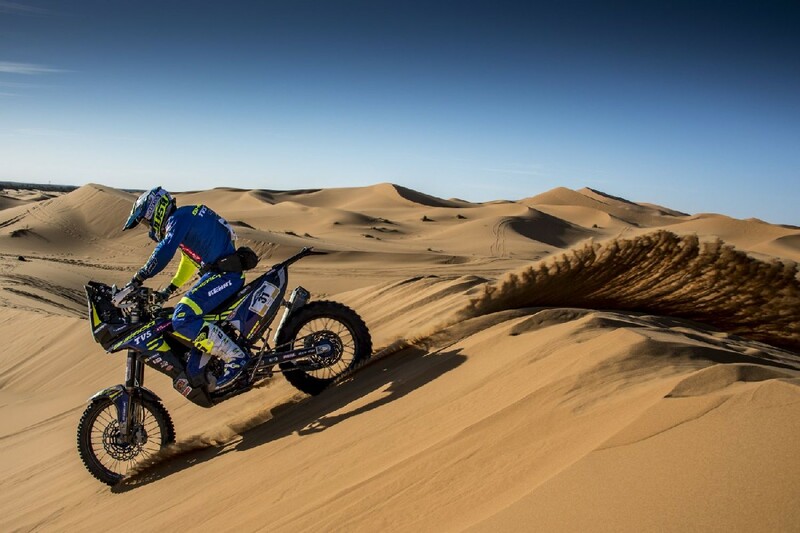 At the end of Stage 4, Sherco TVS Factory Rally Team’s Martin Diego Duplessis sustained his steady performance and finished at 10th followed by Joan Pedrero at 15th despite a fall during the stage. Vanni Cominotto finished the stage at 36th in the overall rankings. Despite a good start, Lorenzo Santolino had to retire from the rally due to technical issues. Stage 5, the final of the rally, will see riders start in a group before heading out into the short 50km stage. Consisting of 100 per cent dunes, tomorrows special will still require ultimate concentration and good navigation. The ultimate stage of the rally will be a motocross style start and offer 49 km of fast paced shoulder-to-shoulder action before the new champion is crowned. The final stage of the Rally, a true Merzouga classic, will be the deciding factor for the riders, and see them cover 48 kilometers into the dunes of Chebbi erg. One reason is that TV coverage of rallies in general is far more difficult than circuit racing. Since it is near impossible to have cameras covering the entirety of the route. Unlike a circuit, where every corner will have multiple cameras. See the number of comments here on this thread as compared to a "XYZ bike new colour scheme launched" thread! Indian 'bikers' in general are not very interested in motorsports. The fifth and final stage of the Merzouga Rally comprised a short 50km timed special through the dunes of the Chebbi erg. With 80 riders setting off together motocross style it took a few kilometres for the pack to spread out. Despite being shorter than the others on the rally, stage five still threw up some challenges. It was a high-octane and intensely fought stage, all in dunes, which aptly brought the curtains down on the rally on a high. For Hero MotoSports Team Rally, it ended in another good result with Oriol Mena finishing in top 15 at 15th position and C S Santosh finishing in top 20 with a 19th place. 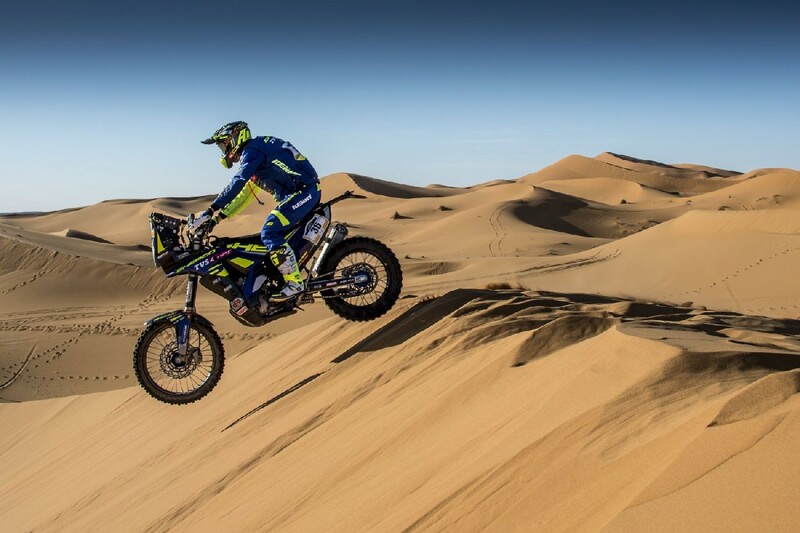 The team will take a lot of positives from this result considering that in this edition of the Afriquia Merzouga Rally, almost all the top teams and top riders of the Dakar were competing, imparting it a flavour of a “mini – Dakar”. Red Bull KTM Factory Racing’s Toby Price has brought his KTM 450 RALLY home in third place on the final stage of the 2018 Merzouga Rally. Suffering a small crash during the timed special, Laia Sanz finished a very creditable 30th. At the close of the six-day event in Morocco, Price finished sixth overall with Sanz placing 14th. Unhappy after the decision by the organizers of the rally to scrap the final waypoints of Thursday’s stage four, Toby Price went into today’s special with a point to prove. After making his way to the front of the group, the Australian put in a strong performance to eventually cross the line in third position. The decision to disregard the final waypoints of Thursday’s stage relegated Toby to sixth place in the overall standings. Despite his superb performance on today’s stage, it simply wasn’t enough to regain a podium position. Although disappointed, the 2016 Dakar Champion was still positive about his, and the team’s, performance on the rally. Laia Sanz also suffered from the decision. The Spaniard had ridden an almost flawless stage finishing as fifth fastest. By scrapping the final waypoints, Laia was relegated to 14th at the end of the day. Relishing the chance to race with the front runners on today’s short sprint Laia set off well, keeping up with the leaders. Unfortunately, a small crash ended up costing the multiple enduro world champion even more time when another rider collided with her fallen bike. Crossing the line in 30th position, Laia was still upbeat about her performance. I don't agree with that ,when WRC , Dakar highlights package used to be shown previously i'm sure these rallies are covered too .The channels have to just buy the highlights package and broadcast it ,the participating manufacturers have to support it and i'm sure the channels will show it .We as a biking community have to make our voice heard and push for it or we will have to watch local cricket premier league on all the channels all day.Even WSBK race broadcast has been stopped and i think Xbhp can also play a part by using it's reach with the manufacturers and media houses regarding this .There are a lot of bikers who follow these events though they may not comment actively ,specially with Indian riders like Santosh and Aravind participating in these events. 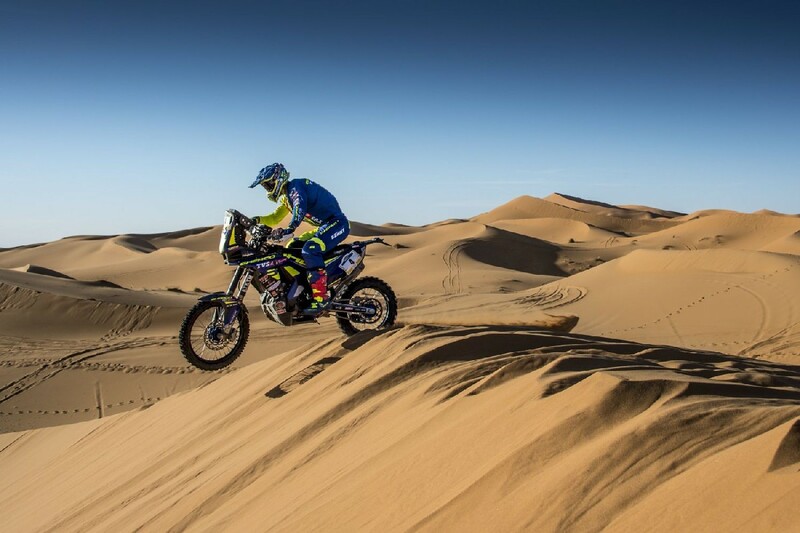 The final stage of the 9th edition of the Afriquia Merzouga Rally saw Sherco TVS Factory Rally Team’s Joan Pedrero finish in the top 10 with a P7 finish, followed by Martin Diego Duplessis at P11. Vanni Cominotto moved upto P21 in the overall rankings while Lorenzo Santolino finished at P31 (post revised stage 4 rankings).